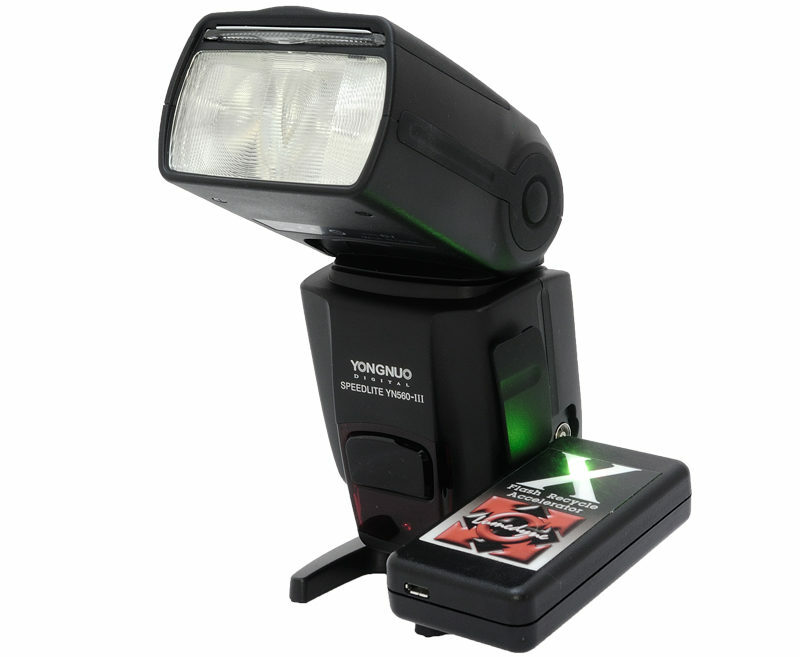 The new Lumedyne 'X' is a cordless speedlight battery pack that plugs directly into the side of your flash. Is it any good? 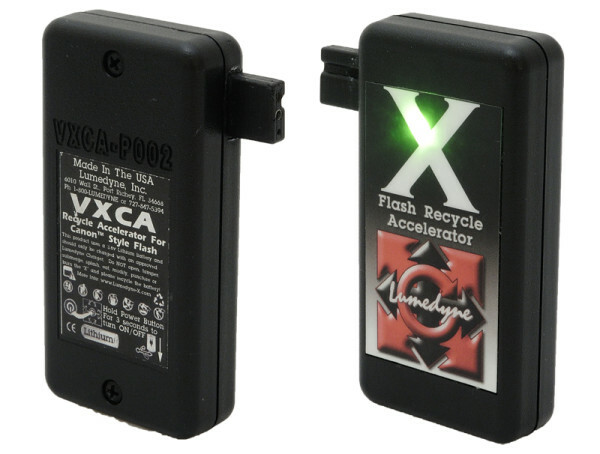 The new Lumedyne “X” Flash Recycle Accelerator is a cordless speedlight battery pack that plugs directly into the side of your flash. It is designed to speed up the recycle time of your flash and make the batteries last longer. Compared to most other external power packs, the “X” is positively tiny, about the size of a mobile phone and tipping the scales at a mere 84 grams. When this product was announced, some readers balked at the US$325 price tag, as well as expressing misgivings about the unconventional form factor. I decided to reserve judgement until going hands-on with the actual units, and fortunately Lumedyne’s DJ Ladez gave me the opportunity to do so. Straight out of the box, these seem pretty well made. The case is strong and the connector isn’t nearly as brittle as perhaps it might appear in photographs. The stickers look a bit naff but they might not be the final designs. There’s a micro-USB port for charging, and a hidden power button behind the “X” logo. The LED indicator (same place) tells you the charge level and power setting. There’s also a smaller red light that’ll blink to indicate you’ve got the pack plugged into your flash unit properly. There are two variants of “X” — the VXCA for Canon and the VXNA for Nikon — which are otherwise identical but for the moulded plug that protrudes from the side. A number of third-party manufacturers use the same types of connectors on their flashes, so you aren’t limited to specifically Canon or Nikon brand units, but everyone seems to put their sockets in a slightly different position so you might want to check that it fits properly first. I tried the VXNA with the Nikon Speedlight SB-800 and the VXCA with the Yongnuo Speedlite YN560-III and Godox ThinkLite TT660. The first two combinations fit perfectly — in the case of the SB-800 on the front and the YN560-III on the side. The TT660’s front-mounted power socket is slightly recessed, so the Flash Recycle Accelerator’s short plug doesn’t reach in as far as it does with the Yongnuo. It’s also upside-down, but it slides in far enough to work. I tried holding the SB-800 X-side down and shaking it violently and couldn’t get the battery pack to fall out. And the plug has a reasonable amount of flex to it. So it seems that concerns about the X snapping or falling off the side of a flash were unfounded. Your experience with other flashes might vary, though. In particular, you might want to check that it doesn’t block other connectors, such as the sync port, which is sometimes adjacent to the power input. So the hardware seems good enough. The advantage over other battery packs is that you don’t have a great big box hanging and clanging around your light stand. 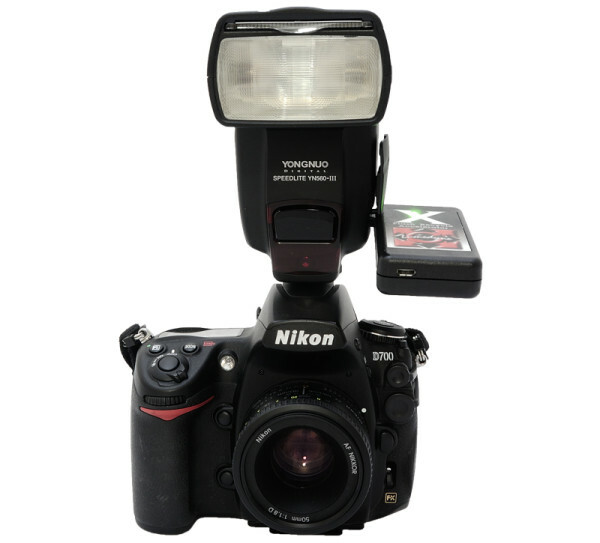 The positioning of the X on the front of the SB-800 also lets the flash stand upright on a tabletop without the need for a dedicated mini-stand. It also has sufficient clearance that it doesn’t get in the way if I’m using any of these flashes on top of my Nikon D700 DSLR camera. But how is the performance? It’s all well and good buying a nicely made gadget, but not much point if it doesn’t do the job for which it’s intended. In terms of recycle speeds, I got the following results, using the Lumedyne X in combination with my usual choice of Panasonic Infinium rechargeable Ni-MH AA batteries. It’s clear that the Flash Recycle Accelerator is doing what it says on the tin — shortening recycle times. But the difference is not a great one. On each of the three flashes available, the improvement was between 10% and 30%. That is of course welcome, but is it really offering you good value for $325? The other possible benefit would be taking some of the strain off the batteries inside the flash itself. I did a “stress test” with the Yongnuo YN560-III to see what would happen. Firing full power flashes every eight seconds (an arbitrary limit, the subjective threshold for “too long” in terms of waiting between shots), an X-powered YN560-III lasted about 200 shots before the recharge times extended into unacceptable duration. However the flash kept firing with circa ten-second recycle times for a further 100 shots without running out of juice. Switching off the flash then, the X felt warm to the touch. The AAs were so hot I couldn’t touch them. With a freshly-charged set of AAs alone, the YN560-III managed about the same number of shots before recycle times got too long. But when I removed the batteries (after just 250 frames) they were so hot that an impressive burnt paint smell permeated the air, and the previously-shiny coating on my Infiniums had turned into an interesting matte snakeskin pattern. The flash was unharmed, though. It’s clear that the X was reducing the chances (however slightly) of the equipment catching fire. Always a plus. But is it good enough? Part of my own experience is in events photography, particularly in nightclubs, where I was always shooting between 1/4 and full power and took hundreds of shots. Even with a big Propac battery pack, my flash would risk overheating in the crowded, hot venues. In this case, the difference between 200 and 250 shots was not really significant. And having a Propac clipped to my belt was not an issue, even with revellers spilling their pints of beer over it at regular intervals. So I’m not sure what the appeal of the smaller, less powerful X would be. When I’m doing other projects, such as portraiture, I tend to use studio lights, or take just a few batches of shots using speedlights. So I wouldn’t bother with a battery pack at all. “You yourself may be a better customer for our larger HV Packs that give a significant performance boost even though it is a separate pack and cable? Soccer moms won’t ever buy either product at any price. So it seems to be down to personal preference. Do you sometimes demand high performance? And are you simultaneously so annoyed by the concept of clipping a battery pack to your belt or hanging it from a light stand that you’re prepared to pay more in money and performance to avoid it? This product isn’t aimed at me. Apparently there are people out there to whom the Lumedyne X is more appealing, but I’m not entirely sure who those people are. If you agree, disagree, or have other feedback, please let me know in the comments. The X Flash Recycle Accelerator is available directly from Lumedyne’s dedicated web site for US$325 per unit. For your money you get the battery pack, two USB cables, a car charger and universal mains adapter. There are plans for a UK distributor too, but there is no word on pricing or availability for that yet.